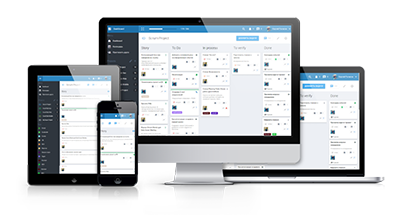 Scrum Time is a Project Management System, a workgroup control tool, a planner, and a task manager all in one. You get it free of charge or for a minimal price. Managing tasks using a simple and friendly interface. Burndown chart, team load, number of executed SPs, percentage of sprint execution. Visualization of the entire workflow on one page. Integration with Google Calendar and Google Drive services. Track how much you or your team spend time on tasks. Link to your team directly from the interface or mobile application. Scrum-style dashboard with a limited amount of Scrum features. The Dashboard allows you to overview all the running tasks and their progress. It can be used both with team-based projects and individual ones. The workflow is free and based on self-regulation. The actions are performed by a single move within a user-friendly interface and don't need any instructions. 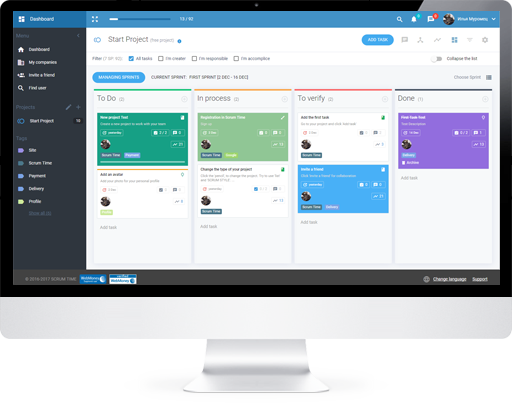 Scrum format includes the most important feature – the Dashboard, but it also adds the workflow and personal tasks organization logic. Everything here is built upon Scrum and all the necessary Scrum-tools are included. If you decide to use this type of project, you must understand Scrum terminology: Sprint, Meeting, Story Points, etc.. For this, please refer to Infobase section. This style get to create new task statuses. It can be used as a basic tool for managing customer relations (CRM). Fixed prices Scrum Time for any styles, give to get an advanced business application for your company at very favorable rates.